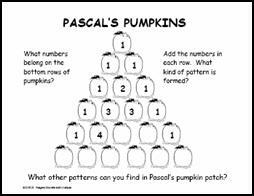 These seasonal activities were developed to provide students opportunities to analyze and learn the patterns of Pascal's Triangle. Through repeated exposure to this important mathematical pattern, students will build understanding of the pattern and will more easily relate its use to mathematical problems they meet in the future. 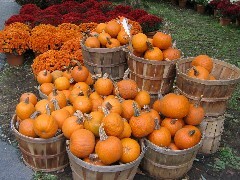 See Pascal's Pumpkins, based on Rutger's Discrete Math Program activity. See Pascal's Ghosts, based on Rutger's Discrete Math Program activity. 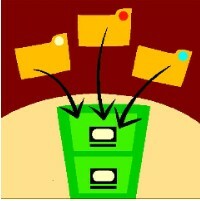 Discrete math applications also include map coloring, organized or systematic counting, combinations, networks and paths, and mathematical codes, which range from the Caesar Cipher and Navajo Code Talkers of World War II to the challenge of protecting the security of information sent via e-mail and the internet today. This branch of mathematics invites students to "think outside the box" and experience math applications from a real-world experience. Learn more about Discrete Math and download activities to use with students. This web page also includes links to enrichment activities on the web and logic games that require students to analyze combinations (e.g. Mastermind) or analyze the best move to win a 2-player strategy game (e.g. Nim).